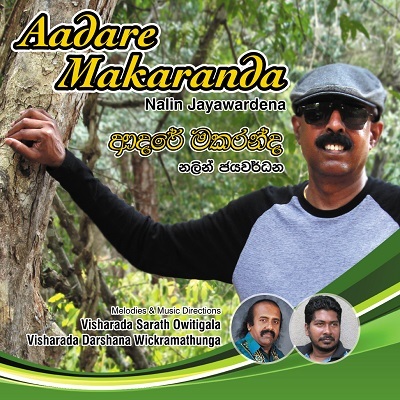 "Aadare Makaranda" is the newest Album release of Nalin Jayawardena for 2017. 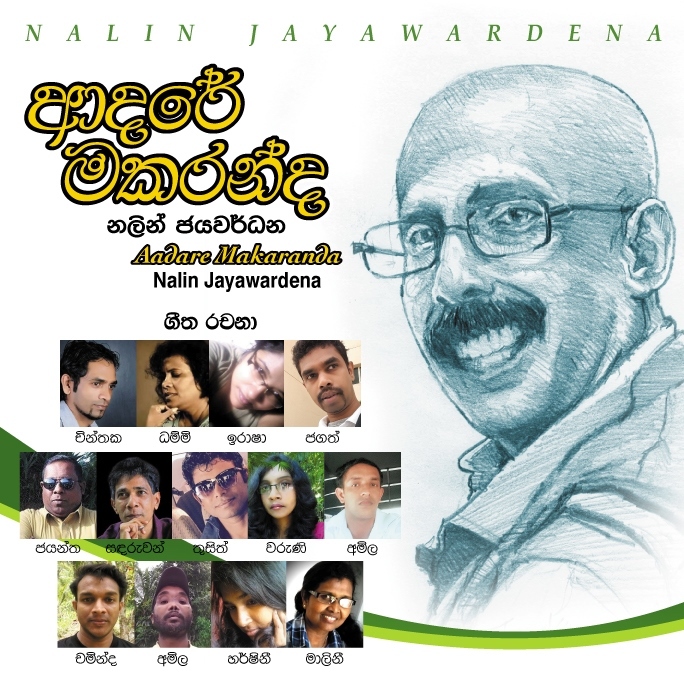 All songs in the album are vocalized by Nalin Jayawardena. Tune compositions are by Visharada Darshana Wickramathuga and Visharada Sarath Ovitigala. Music directed by Ananda Waidyasekera, Sangeeth Wickramasinghe, and Jayanga Dedigama. 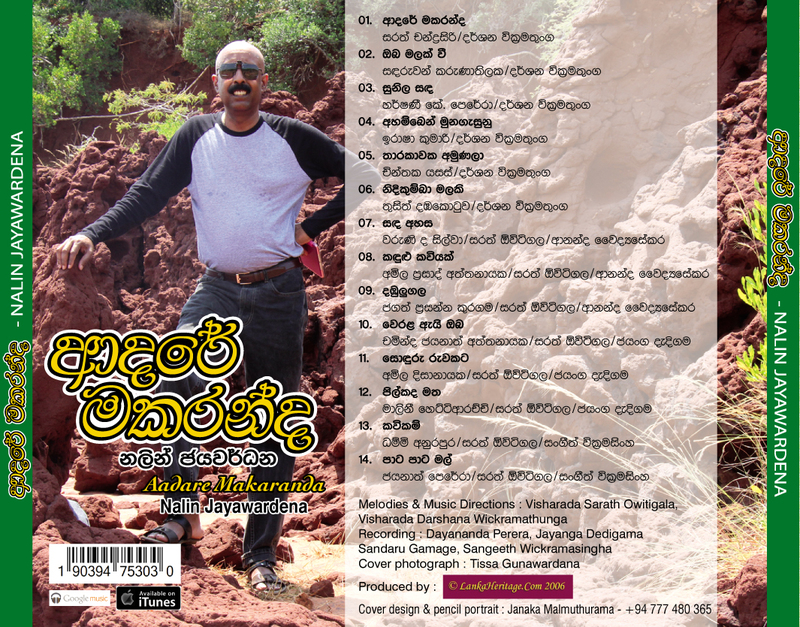 Cover design by Janaka Malmuthurama. Lyrical compositions are by upcoming talented lyricists Sarath Chandrasiri, Sandaruwan Karunathilaka, Harshani K Perera, Irasha Kumari, Chinthaka Yasas, Thusith Dambukotuwa, Varunee De Silva, Amila Prasad Attanayake, Jagath Prasanna Kuragama, Chaminda Jayanath Attanayake, Amila Disanayake, Malini Hettiarachchi, Dammi Anurapura, and Jayanath Perera. For a limited time you can download all the tracks from this CD for FREE for personal use. The tracks from the CD can be downloaded using the links below. The tracks have been encoded using MP3 format and are available in bit rates of 128kbps. Depending on the type and the speed of your internet connection your download time varies. Click on the appropriate icon next to the Track title to start downloading the track. If it doesn't download, Right Click on the Download link and select "Save As" to save the file to your PC. When available, you can download the song lyrics as well. Sorry, we DO NOT have all lyrics of all songs listed on this site. You can listen to the song online by clicking the corresponding button as well. You can also download the cover images of this cd from the links given at the bottom of this page. Note: By clicking on the links to download the tracks, you indicate that you have read, understood and agree to our Terms & Conditions. Sorry, we DO NOT have all lyrics of all songs listed on this site. If you can contribute lyrics, please get in touch with us. Thanks! click on the appropriate icons below. Click on the links below to download the CD Cover Images. Right Click on the Download link and select "Save As" to save the image in your PC. You can use any CD Cover design program to create a cover and print it. Alternatively if your graphics program allows you to set the print resolution, set the print resolution to 300dpi and print directly as an image.